1131 Duck Pond Branch is one of two "end units" located on the duck pond in the Mountain Creek Villas. Recently renovated, this beautiful villa features a large master suite located on the main level and a loft & bedroom updaters, with a private bath. 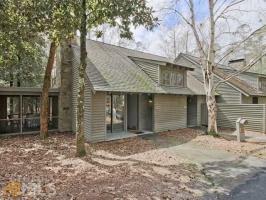 The rear view overlooks the duck pond and there is a quaint screened porch located on the side of the villa. This is one of the best values in the villas area.